Cushing has a long tradition of excellence in athletics for girls and boys, offering superb facilities and coaching at every level. 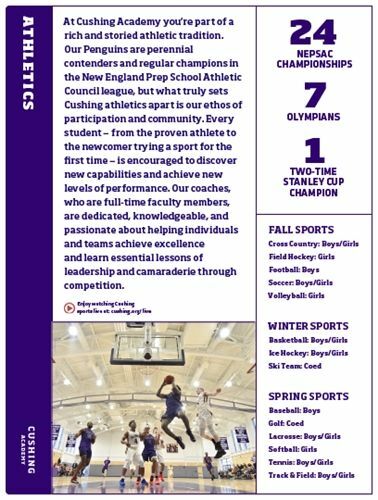 From ice hockey to soccer, lacrosse, field hockey, tennis, and more, we offer varsity and JV teams that face prep-school competition throughout New England, as well as recreational and intramural teams. Our coaches (most of whom are full-time faculty members) are dedicated, knowledgeable, and passionate about helping individuals and teams achieve excellence. Whatever your interest, we look forward to welcoming you into our program. Jen Viana began her career at Lesley University (Cambridge, MA) as the Head Softball Coach in 1999. In addition to her coaching responsibilities, she served as the Assistant Athletics Director in 2006 and was promoted to Associate Athletics Director in 2009. In September 2011, Ms. Viana became Lesley's third-ever Director of Athletics. She joined the Cushing community in 2018. A graduate of Bentley University (Waltham, MA), Ms. Viana was a four-year starter at shortstop, two-time captain and lead-off batter collecting numerous offensive records and team awards. In 1999, she made the switch from player to coach. Since her inaugural season at Lesley University in 2000, the Lynx softball team turned from winless seasons to a championship contender. In 2008, the softball team won the North Atlantic Conference Championship, earning the automatic qualifier to the NCAA Tournament. From 2009-2015, Ms. Viana led the Lynx to seven consecutive New England Collegiate Conference Championships and appeared in the NCAA Regional tournament six times. In 2011, she received the NECC Coach of the Year Award and was inducted into the Hamden High School (CT) Hall of Fame for softball. Ms. Viana was fortunate to combine her passion for coaching softball and traveling around the world. She was selected as an Assistant Coach for Coast to Coast Athletics, travelling to Australia to compete against Olympic Development teams in Brisbane and Sydney in the winter of 2002. In 2004, she served as the Head Softball Coach for the Tuscany Series in Italy winning both tournaments in Arezzo and San Casciano. Additionally, she was selected as the Head Softball Coach for the Robur 58' Softball Series in Holland, winning the bronze medal in the series. In May of 2003, Ms. Viana earned her Master's Degree at Lesley University. She is a member of the National Fastpitch Coaches Association (NFCA) and completed the NFCA's Coaches College, becoming a 4-star Master Coach in July of 2007. She served as the Co-Chair of the New England Collegiate Conference, Senior Women's Administrator of the Athletic Director's Council and conference Treasurer. She has also served on the NCAA New England Regional Ranking Committee and the NFCA All-New England Committee for softball. Ms. Viana is committed to excellence both in and out of the classroom and is excited to focus on student-athlete character and leadership development at Cushing Academy. Ryan Suchanek joined the Cushing community in the fall of 2007. In addition to serving as the Associate Director of Athletics, he is an assistant coach for varsity baseball and football. He attended the University of Massachusetts-Amherst where he graduated from the Isenberg School of Management with a B.S. in Sport Management and Economics, and was a member of the baseball team. Upon graduation, he returned to teach and coach for one year at his alma mater of Greenfield (Mass.) High School. After one year at Greenfield, he accepted a Teaching Fellowship in the Physical Education department at Springfield College. Mr. Suchanek taught Physical Education courses, and served as an assistant varsity baseball coach, while completing his coursework towards a master’s degree in Physical Education with a concentration in Athletic Administration. He resides in nearby Gardner, Mass., with his wife, Kaitlyn, daughter, Carter, and son, Reid. Donald Harmon arrived at Cushing Academy in 1998, spent two years as the Assistant Athletic Trainer before becoming the Head Athletic Trainer. Prior to Cushing, he worked in the sports medicine/rehabilitation field in Connecticut for four years. He received his bachelor’s and master’s of education from Springfield College where he served as a graduate assistant Certified Athletic Trainer for two years. He also played lacrosse for Springfield College for four years. Mr. Harmon grew up on Cape Cod in the town of Sandwich where he attended high school; he also did a post-graduate year at Vermont Academy. He currently lives on campus in Schottland House with his wife, Deb (Nyberg) Harmon and their two children, Harry and Jane. April (Boettcher) Winter graduated from Merrimack College with a B.S. in Sports Medicine and from Gardner-Webb University with a M.A. in Sport Science & Pedagogy. She grew up in North Andover, Mass., and attended Central Catholic High School in Lawrence, where she was a three-sport athlete, winning multiple awards. An avid athlete, she played two years of collegiate soccer at Rivier University, where she earned additional athletic awards. Following her graduation from Merrimack, Mrs. Winter passed the National Board of Certification exam to become a Certified Athletic Trainer. With this certification, she became licensed in the state of North Carolina, where she worked as an athletic training graduate assistant among a staff of nine at Gardner-Webb University, an NCAA Division I institution. She then returned to Massachusetts and became licensed in state to continue her work as an athletic trainer, this time for Division III Nichols College. Mrs. Winter began working at Cushing in 2008 and holds multiple positions on campus. Her prime position is Associate Athletic Trainer with secondary positions as Development Liaison, teacher of Introduction to Sports Medicine, and assistant within the athletics department as needed. She resides on campus with her husband, William, their dog Jacoby, and their cat, Bandit. She enjoys spending time at the beach, going for walks with her husband and dog, watching sports, and going for motorcycle rides with her husband.